That's way too long to go between posts. Accept my apologies? 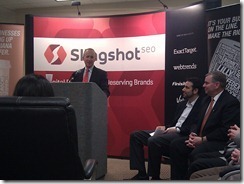 Two years ago I was just coming up on one year at Slingshot SEO. 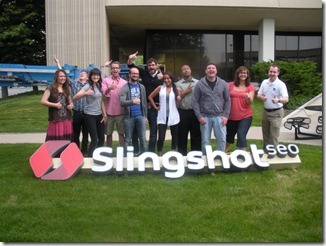 In January 2012, I moved into a new role at Slingshot -- IT Operations Administrator. I am hugely grateful to Don Kane (then CEO/COO) and the rest of Slingshot for taking a chance on me and entrusting to me all our computer and network systems. Under the guidance of Deanna Mettler (then VP of Finance), I grew so much in the year and a half that followed. I matured as a person, as a professional, and as an IT administrator. So much so that an industry contact reached out to me in early 2013, and long story short, I was fortunate enough to find a great match in a company that was looking to begin a new role -- Director, Information Services. Apparently the positive feelings were mutual, because they hired me and I began work at DK Pierce and Associates in June. There are many amazing people and great friends I miss from Slingshot SEO (ahem, DigitalRelevance), but this new chapter of my life has been terrific so far. DK Pierce and Associates is a healthcare reimbursement consulting firm based out of Zionsville. Currently with 19 employees, DKP was started by Denise Pierce nearly 15 years ago to help clients navigate the complexities of the current healthcare environment, particularly working with pharma companies as they go about bringing new drugs to market. It is an incredibly bright team of mostly women (seriously -- 16 of the 19 employees are women, and DKP is a certified Women's Business Enterprise). One thing that makes us unique is that about half of our workforce -- the Away Team -- work remotely from all along the East Coast. The rest of us work in the Zionsville office. Well, most of the time. We're currently renovating and expanding our office -- we own the whole building! -- which is exciting to be sure. But it means that none of the Home Team is working in the office; we're working, more literally, from home for the summer. I really shouldn't complain about not having to shower for work, but in all honestly I'm ready to be back in an office with people around during the day. I get so stir crazy! I intend to highlight some more details of my new role in future blog posts. My intention is to make this blog a personal blog, yes, but also to begin discussing IT industry topics and my perspective on them. We'll see how that goes. For now, I'm just so blessed to be where I am professional as well as personally. Cheers to a great 2013 so far! Well, the day finally came. On Monday, October 3, I had microdiscectomy surgery to attempt to repair a 3+ year old herniated disc and associated pain. 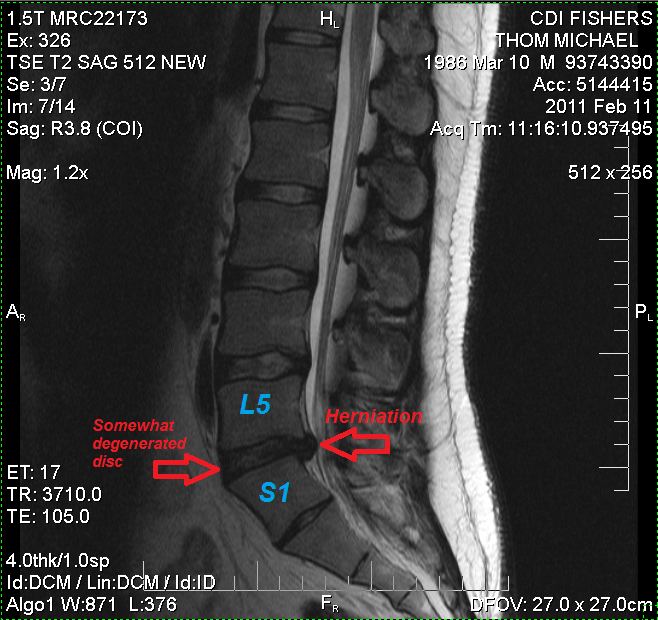 The disc between L5-S1 is degenerated, and you can see the herniation out the back side clearly. The injury happened when I was laying floor tile at the Christian Campus House in July 2008. I was working by myself, lifting improperly, and working quickly to get the whole job done in a matter of just a couple days. I learned a lot about laying ceramic tile (and for the most part the job turned out really well), but I also learned a lot about how to lift properly. After this initial injury, I let a couple months go by without doing anything about it. I finally told my mom (who works at a Sports Medicine office in Indy that also has a Muncie office), and I got in to see the doc in the Muncie office. He prescribed a muscle relaxant, and I headed off to some physical therapy (also in Muncie) to try to straighten out my badly torqued torso. This post is in progress! I want to actually come up with (nearly) 100 things, but I figured I've been sitting around 25 for so long that I need to just get it posted before much more time passes. I'm open to ideas of things to add though, so feel free to throw those in the comments! So this post was inspired by Matt Todd’s 100(ish) Things post, which was itself inspired by Papa Joe’s 100 Things to Do Before I Die. I’ve always wanted to assemble a list like this, so that was the inspiration I needed! So here goes. Oh, and a quick disclaimer. I don’t make any promises to actually do all of these, as I know many of them will be very difficult/expensive to make happen. Open to more ideas! Please leave them in the comments! I know I haven’t posted in a few weeks… But I just had to mentioned that we’ve been killing it at work lately. First, we got a sign on our building. This helped solidify our commitment to staying in Indy, in our very building. It’s so cool to see Slingshot SEO on the building when you drive by! Then, Indiana Governor Mitch Daniels and Indianapolis Mayor Greg Ballard came on-site one Friday for a short press conference announcing their support of our efforts as we have committed to adding over a hundred new jobs in the next year. What a cool thing it was to have those gentlemen in our newly renovated office! We celebrated with some breakfast foods. The funny part of this event was that most of us aren’t in the office on Fridays, and yet no one complained about coming in to support the company and be a part of the event. So to celebrate it all, we had a party last Thursday, complete with live music, a photobooth, Wii, a caracturist, and awesome food catered by Scotty’s Brewhouse. It was great to meet clients, partners, and employee’s families. 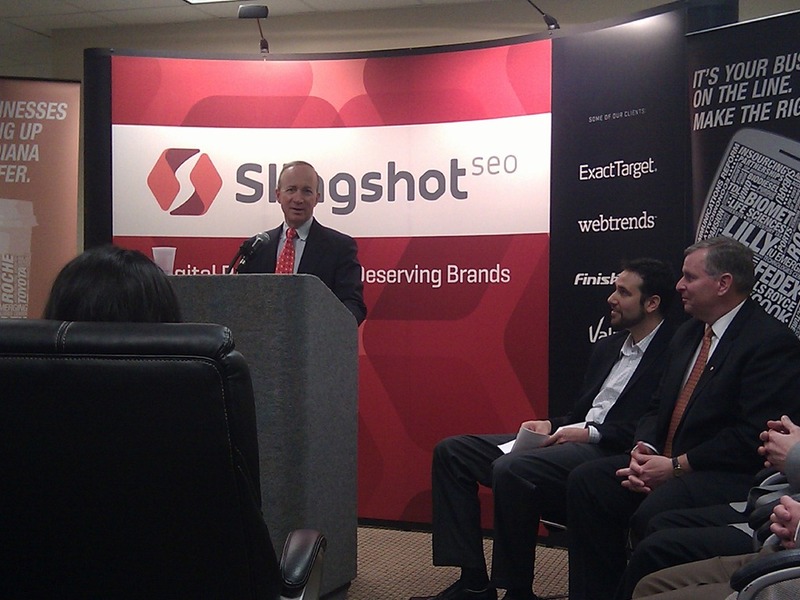 What a cool team we have here at Slingshot SEO. Awesome, fun, hard-working employees. Terrific leadership. And great products and results for our clients. It’s been a while friends. To those of you just finding my blog, welcome. To those of you who have been sitting up every night since my last post just waiting for that sweet moment I post again, I know a great psychologist I can recommend. For everyone else, I promise this over-wrought intro is now over. Since my last post in August of 2009, a lot has changed. At that time I believe I had just started substitute teaching but was still looking to find more permanent work. I finally found that at the end of September, and on October 5 I started work at ExactTarget. What a perfect job, or so it seemed. Fun (though busy and stressful) work, a great atmosphere, and awesome people to work with. I made several new friends, learned a lot about email marketing and even just corporate life in general, and enjoyed my time there. However, all good things come to an end and, unfortunately, I found out this past September that I would be leaving ExactTarget. October 6, 2010, was officially my last day, so at least I made it to my one-year anniversary – even if only by one day! But God is good, and after a 7-week “vacation,” I found new employment at Slingshot SEO, a young, fun, growing company operating in a space of the internet where there is so much room for growth. I’m only a few weeks in, but so far I’m loving it. Also this past summer we got a dog! 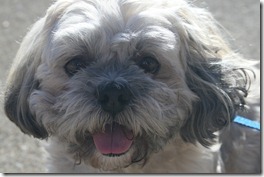 We adopted a 6-year-old Lhasa Apso from an animal shelter and named him Yogi. He’s been a true joy, and we’re so blessed to have our first dog-child. Beyond all this, I have no further excuse about not blogging. I’ve certainly had lots of thoughts on various topics, but I’ve been too mired in other things to get my creative thoughts out on this digital paper. But I’m back! And I’m planning on blogging much more frequently now, sharing my thoughts on things as I encounter them. And to new readers – don’t worry, this isn’t a personal blog, per se… most of my thoughts will stem from personal experiences, but this is not just a daily journal of things I’ve done. 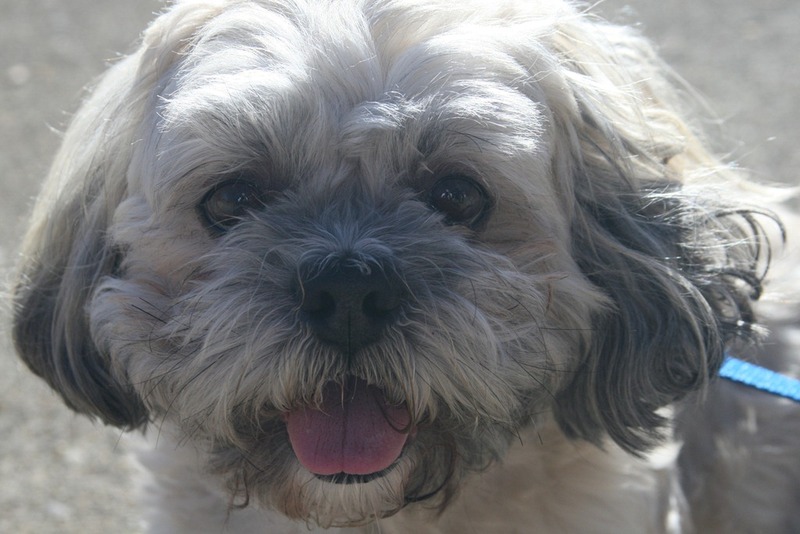 But sometimes you just gotta post a picture of a cute dog. Leave me comments, questions, or topic suggestions in the comments below! Author’s Note: To those of you looking for information regarding the discontinued NBC soap opera, you will be dismayed. Furthermore, this post will not deal with Dictionary.com’s first five definitions for the word “passion,” three of which deal with “sexual desire.” Sorry to disappoint. Producer’s Note: Yes, the Author and Editor are one-and-the-same. Or is that two-and-the-same? Why is it often so hard to figure out what you truly enjoy doing the most? I’ve never been a big fan of the career aptitude tests some high school students take to help guide the college major selection; I’ve always believed that an individual will know what is right for them to pursue, whether as a college major or a career. I must admit I’m having a little trouble with this myself, though. Most people know me as a music guy. I play trombone. (Or, if you know me from church, perhaps you know me as that drummer who plays some guitar on the side.) “So where are you teaching now?” I get asked by old friends and acquaintances, those who knew me during my tenure as a music education major at Ball State. Though I appreciate the conversations, I hate having to answer that question, largely because I don’t have one, “perfect” answer. I am set to start working on Tuesday, September 8th, as a substitute teacher in Lawrence Township schools. I am thankful for a job (albeit a “full-time” job at “part-time” wages), but it’s not my life’s dream. I don’t take any particular joy or pleasure in teaching, especially middle-school kids (which is where I will be). It’s not my strongest suit. So I find myself daydreaming about, applying for, and occasionally even interviewing for other jobs (especially ones that are actually full-time and salaried!). I have too many things that I have some level of fondness, enthusiasm, or desire for. I’m struggling to “limit” myself by choosing just one as a career and relegating the others to the “hobby” category (and, in reality, doing away with some entirely for lack of time and/or funding). Here I will hash out a few ideas. Music has always been an important part of my life. I love listening to music of all kinds. I enjoy making music, whether playing trombone, playing drums, playing guitar, playing bass, singing, or even arranging music. I do enjoy teaching music, particularly being in front of an ensemble and making music through the players in front of me (again, why I would enjoy high school/college over middle school). I’m just not sure that it is something to do professionally, full-time. I have said since finishing high school that if I could get a full-time orchestra gig, playing with the Indianapolis Symphony Orchestra, or the Cincinnati Symphony, or Cleveland, etc., I would love that. To get paid to play my trombone is awesome. (I am fortunate enough to be playing with the Muncie Symphony Orchestra “full time” this year, but the MSO’s full-time is still very part-time.) The reality is that it is very unlikely that I will ever win a full-time orchestra audition, so I cannot bank on this. But what to do with my computer skills? Many friends and family know me as the go-to guy when it comes to fixing/building computers. And yet, lacking any formal certification or training, I’m not terribly marketable to potential employers who want someone with “proven” computer chops. “What? Michael can’t even read!” Yes, politics. There are times that I get very deep into reading, listening, and learning about current events and issues and historical events and issues, and at these times I feel that I would love to be involved on some level in politics and current events. That might be as intense as actually running for some local office. That might be as far from that as just writing and commenting about issues. As anyone who truly knows me can attest, I am very opinionated. I wish I had the time (the “reason”) to spend truly becoming knowledgeable about issues. If I did, I would love to use that knowledge to help make a difference. Yeah yeah, it’s dangerous. But what kind of a man am I if I am more concerned with my own physical safety than the safety of others? I enjoy a certain level of risk in most things I do, so that wouldn’t bother me. I am respectfully aware of danger, though, not recklessly unsafe. I am also very alert, perceptive, vigilant, aware of my surroundings at all times, and I would love to use these traits to help protect and serve others. These are just the main four areas that come to mind as I am writing this. If I had to pick just one of even those four to focus on, it would be very difficult – a near-tie between law enforcement and computers. Computers I have more experience and direct knowledge about, but I feel that I have a great aptitude toward both; I probably would receive more direct pleasure from law enforcement. See my quandary? I enjoy serving people. I think that is apparent in what I’ve already written as well as in what I didn’t write about: my recent history, college experience, and full-time employment with a church last year. I’m just trying to find the best way to use the gifts God has given me to serve Him by serving His people. This should be a happy experience, and it mostly is, I’m just struggling to find the best fit for me. The job market isn’t helping much, to be sure, but ultimately it is up to me to make an opportunity for employment. In fourteen days, I will be married. So unbelievable. It wasn’t that long ago that I thought marriage was for all those “grown-ups” who were done being young and having fun but wanted to raise kids. Natalie and I have both grown so much the past few years, and I am certain now that we are ready to get married. Two years ago when I proposed, I knew we weren’t yet ready to get married right then, but I was confident that we would be, and confident that it was Natalie I wanted to spend the rest of my life with, share everything with, and, yes, raise children with. But I’m happy to say the Lord has worked in us in so many ways, through several important people, particularly over the last two years. I’m also very much looking forward to becoming an official resident of Fishers. Don’t get me wrong – Muncie’s been great to me the last five years. In fact, I actually have grown quite accustomed to the “small town” feel (yes, people from truly small towns: it’s a “small town” compared to what I grew up in). I feel that I have made as much of my home as possible, particularly in the past three years since I moved into my house off campus. But I really like the Town of Fishers. It’s located just across the county line from where I grew up (we lived literally six blocks due south of Fishers), so it’s pretty familiar. Our apartment seems nice and quite large, and I cannot wait to set up our home. I move in six days; I have already packed most of my stuff. These next six days cannot pass quickly enough! So, let me explain… truly, don’t read too much into this. Basically, I had this laying around my house, wanted to keep it but wanted to throw the piece of paper away, and don’t have a scanner. Thus, I’m posting it here to save it digitally, in a sense… in the cloud, I suppose. At the same time, it is a bit interesting, and perhaps thought-provoking. Feel free to read and comment, as I guess I am posting this for a *little* more than just the purpose of it serving as my online backup, haha… anyway, it’s from the “PREPARE/ENRICH Program” Natalie and I did as a part of pre-marital counseling through East 91st Street Christian Church. Define the problem or issue of disagreement. How do you each contribute to the problem? Brainstorm. List all possible solutions. Discuss and evaluate these possible solutions. Agree on how each individual will work toward this solution. Set up another meeting. Discuss your progress. So, this has been a bit of a tough week for me... for so many reasons. It's also been a great week, for some of the same reasons, frankly. All details aside, let's just say I've had a couple significant blows to my ego. I have no great thoughts to impart here, but just allow me to say, pride can be a killer, and it can be so easily a problem without even realizing it. If you had asked me two weeks ago if I had a problem with pride, I would have said no way; sure, I can be a little arrogant on a small thing or two here or there, but I have no significant problem. Unfortunately, I have learned that's not the case. Actually, though it's unfortunate that it's been the case, I'm very glad that I found it out now, before any more time went by. Cool, huh? Also, just trying the blog-from-flickr feature. 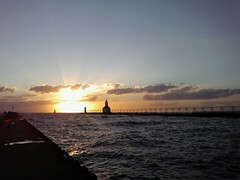 I took this pic with my phone camera while in Michigan with Natalie for her family reunion.